I took yesterday and today off to escape to Vancouver Island for a pre-Christmas visit with my sister and parents. The -4 degrees c. cold woke me up early this morning, and I wasn’t sure if I was up for voluntarily stepping out into it, but a visit to the town where I grew up isn’t complete without a walk along the Cowichan River with my dad. So I borrowed a toque and scarf, and we set out. 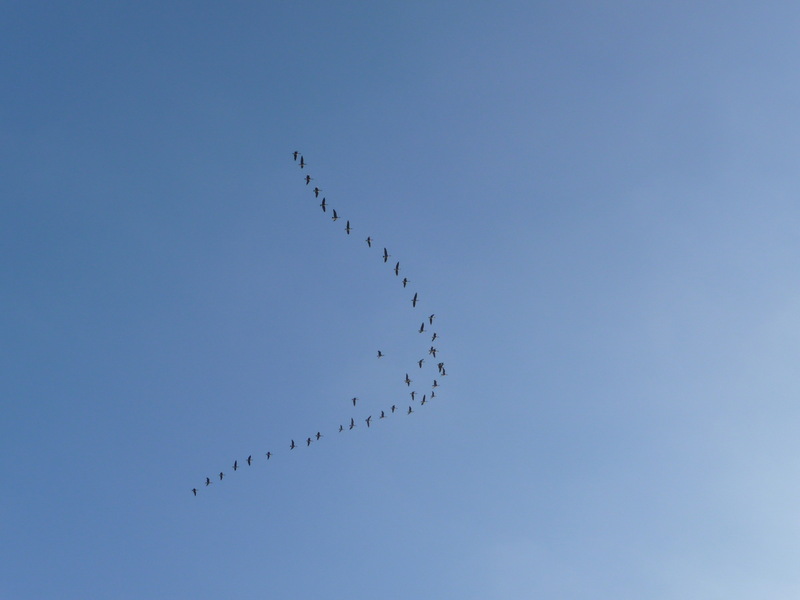 As we walked, a V of geese passed overhead (heading toward Cowichan Bay). 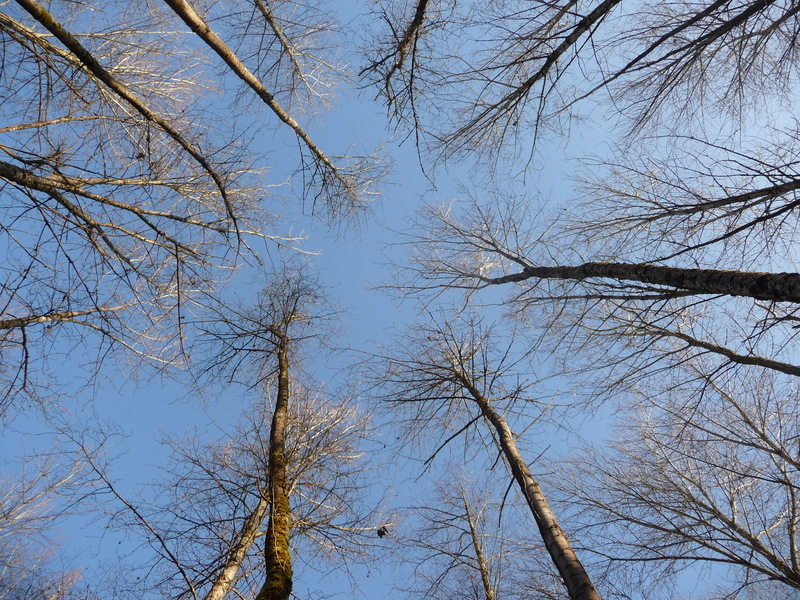 We stopped by the sewer lagoon to check if there were any eagles sitting in the big nest in the cottonwoods (none this time), then walked on top the dike beside one of the creeks that flows into the Cowichan. 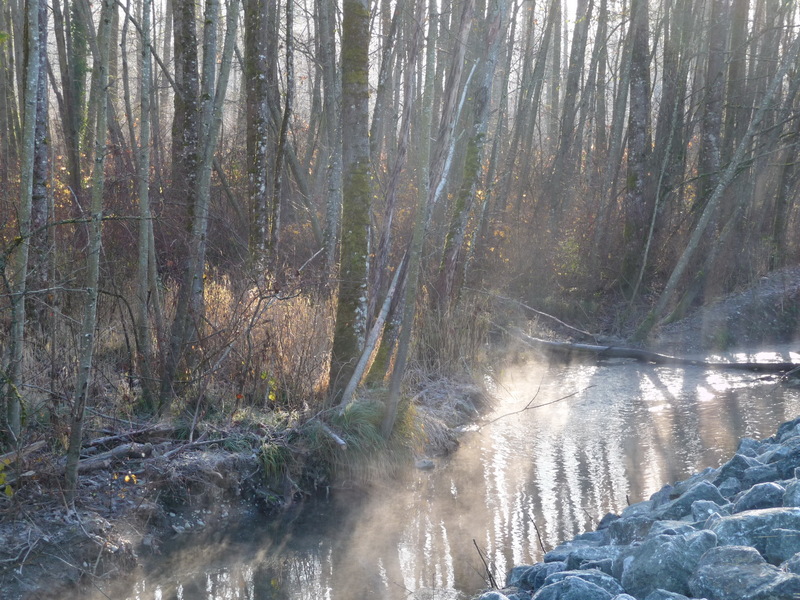 Mist rose up from the water, and rays from the low sun slanted through the trees. 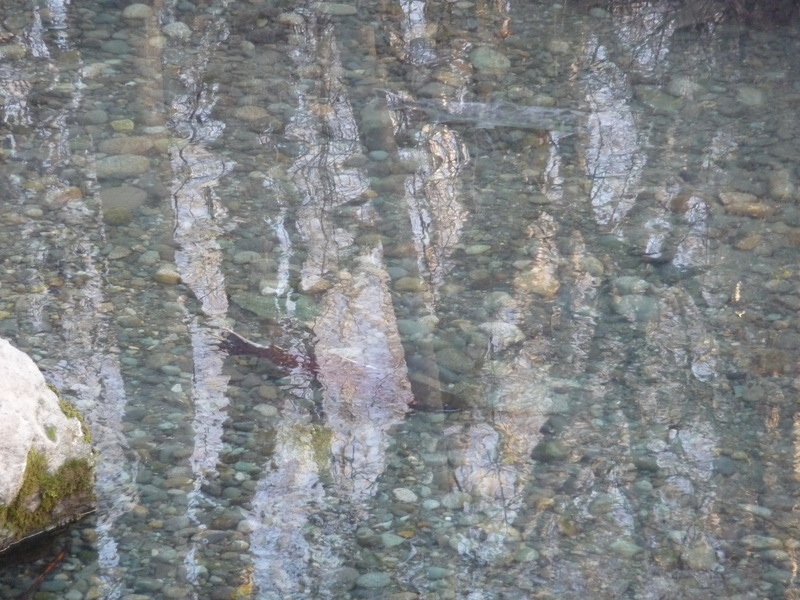 Two kinglets and a wren poked along the shore, a pair of mallards floated by, and two pale salmon moved like ghosts beneath the surface of the water, appearing and disappearing as the rippling reflections moved and changed. 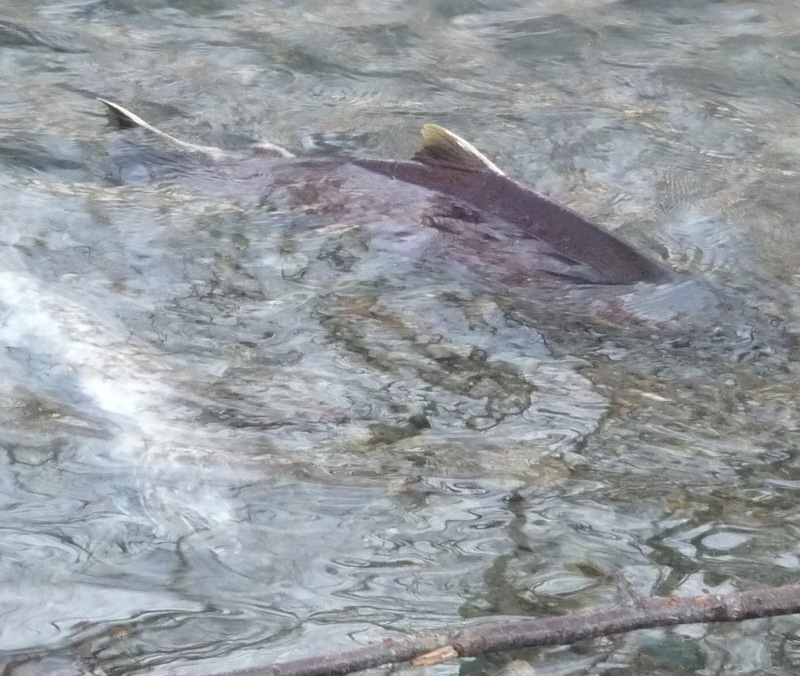 Further along, the red fin of a male salmon sharked up above the water as he splashed upstream. 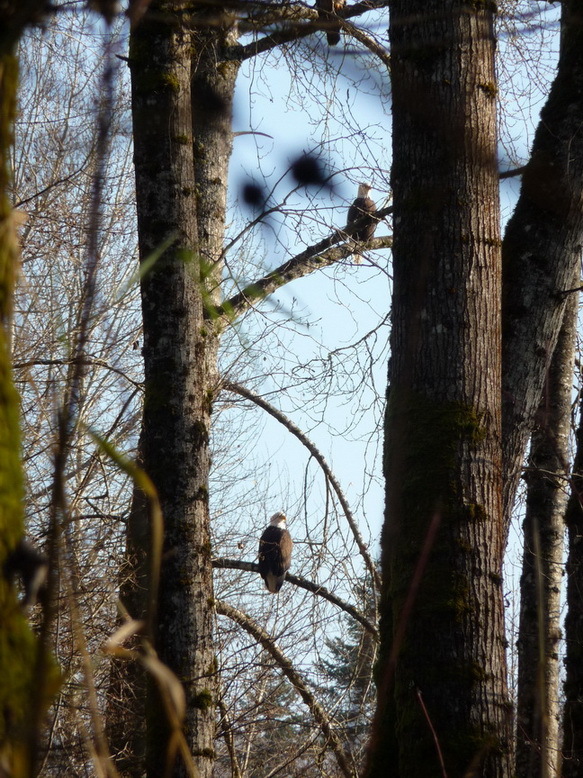 Beyond the creek, closer to the river, I caught sight of an eagle sitting on a branch, and then another. Counted seven sitting in the one tree. A few more in other trees. 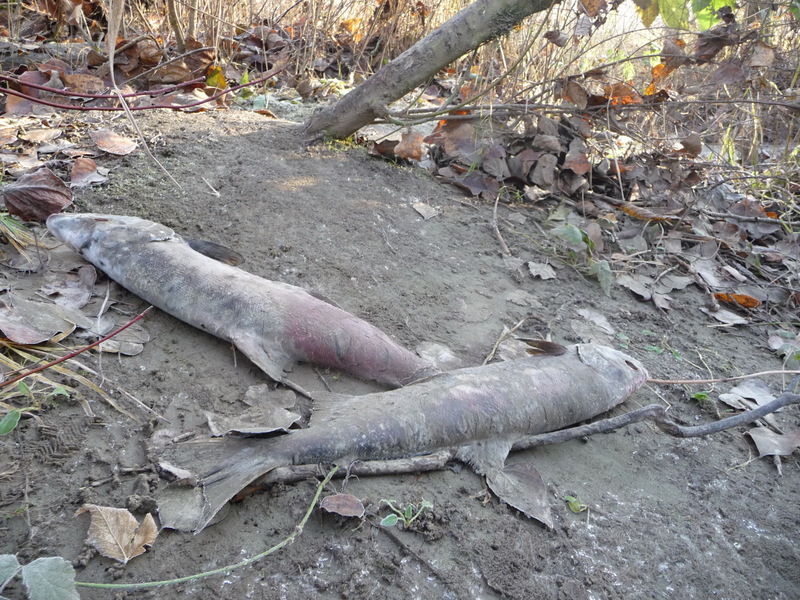 We walked along a dry stream bed to get closer, stepping over the decaying bodies of salmon that had swum upstream to spawn (in vain) weeks ago when the creek was full from the fall rain. 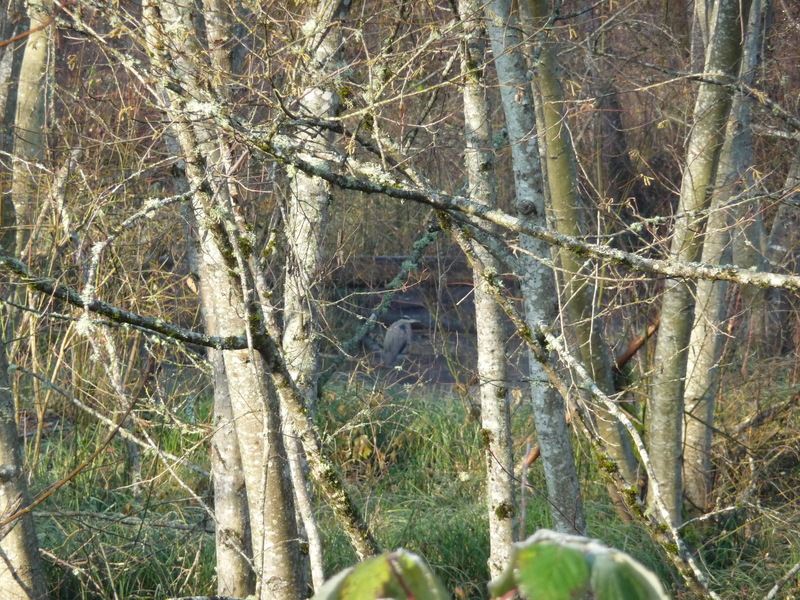 Back on the dike again, we glimpsed a great blue heron through the trees. 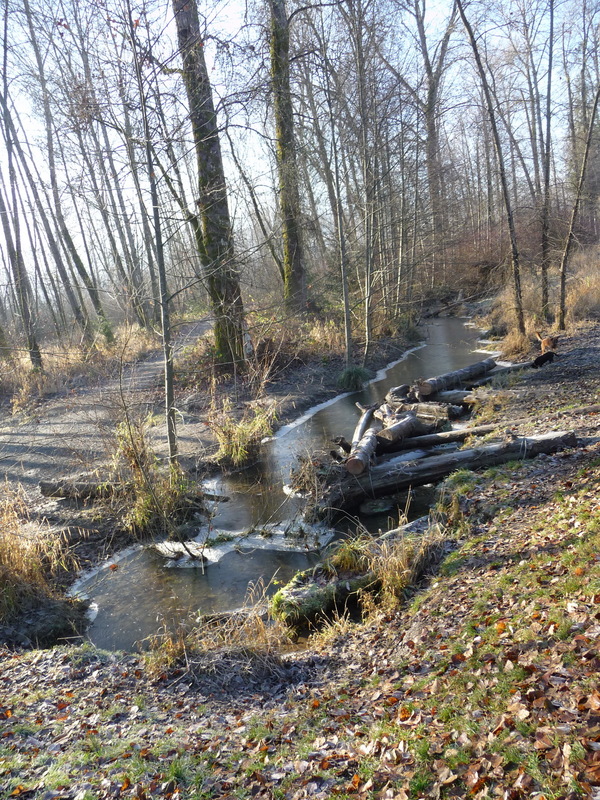 Passed two eager dogs, checking out a frozen section of creek. 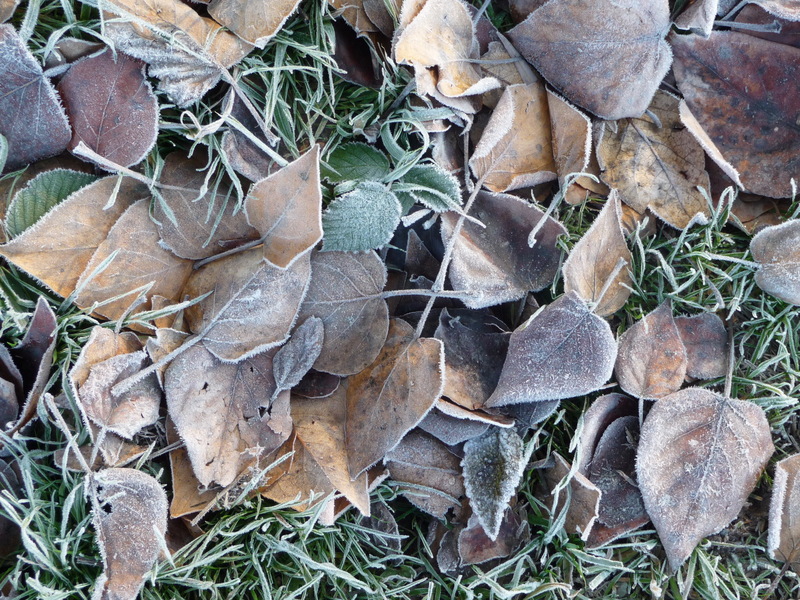 On the ground, frost fringed leaves and grass. 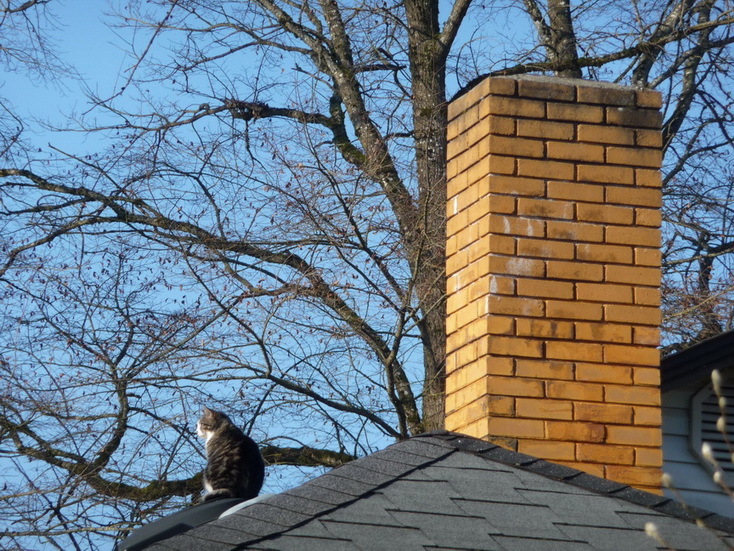 A good day to walk and look (or sit on a roof and contemplate the day, as this cat we spied on the way home seemed to be doing). 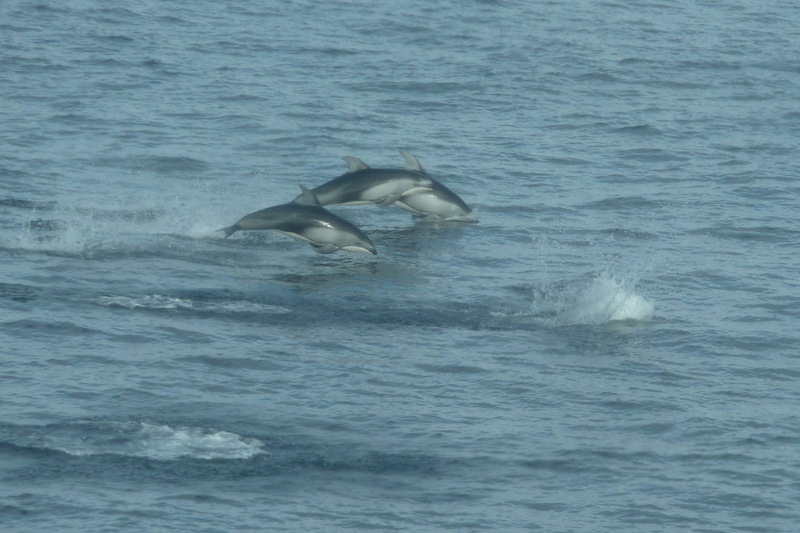 Later, sitting on the ferry on my way back to the mainland, something made me put down the book I was reading and look out the window –just in time to see a pod of dolphins arcing above the waves along side the boat.